It lately occurred to me that there are concepts that I use (and see used by others) in creating variations on polyform puzzles that I haven’t seen explained very thoroughly, and it might be helpful if I used this space for just that purpose. The first of these is the use of different kinds of symmetry in defining the set of pieces used in a puzzle. (I touched on this in my post on rectangular-cell pentominoes.) 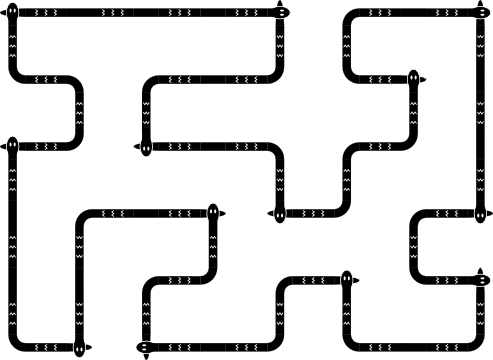 Normally, all combinations of rotations, translations, and reflections of a polyomino in a grid are considered to be equivalent. Leaving aside translations for the moment, the possible rotations and reflections of a polyomino are equivalent to the group of symmetries of a square. We can find variations on polyominoes by restricting the allowed symmetries to subgroups of that group. 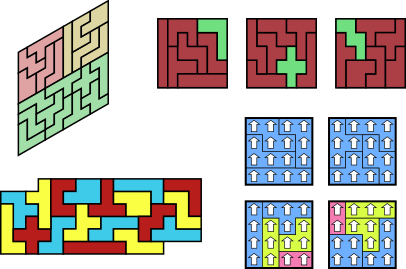 For example, the one-sided polyominoes are the result of allowing only rotations, not reflections. Rhombic cell pentominoes (which Kadon sells) allow 180° rotations, plus diagonal reflections. My Agincourt puzzle allows only reflections over vertical axes, assuming that the arrows are pointing vertically. Notice that it doesn’t matter which direction the arrows point as long as they point in the same direction; this suggests that what we are interested in isn’t symmetry subgroups per se, but classes of subgroups where two subgroups that are related to each other by symmetries of the square are equivalent. What are all of the possible variations with different allowed transformations? We can generate a representative subgroup of every class by using some combination of reflection over a particular axis parallel to the grid, a particular diagonal axis, and 90° and 180° rotations. Here’s a chart of the symmetry variations this produces. I chose the above terminology for the types (after keeping “free”, “one-sided”, and “fixed” as established terms) in order to build in some helpful mnemonics. The types with four symmetries have short names. The types with two symmetries have longer names based on the names of the types whose symmetry groups their symmetries are subgroups of. The odd duck here is “polar one-sided”, which is a subgroup of all of the larger symmetry groups, but putting “one-sided” in its name makes the types with two symmetries nicely echo the names of those with four. Problem #28: Tile a 6×6 square with the oriented parallel, oriented diagonal, and polar one-sided trominoes. No tromino should touch another of the same type. With these symmetry subgroup based polyform variations in mind, any type of polyform on a square grid can be transformed into an entire family of polyforms. In particular, polysticks would reward exploration in this light, which does not seem to have occurred yet. A similar analysis to the one above can be made for symmetry based variations of polyiamonds and polyhexes. Bringing translation symmetry subgroups into the picture leads to things like checkered polyominoes. I may get to these in later posts; this one was getting long enough that I needed to wrap it up. Rodolfo Kurchan has posted Puzzle Fun #25. 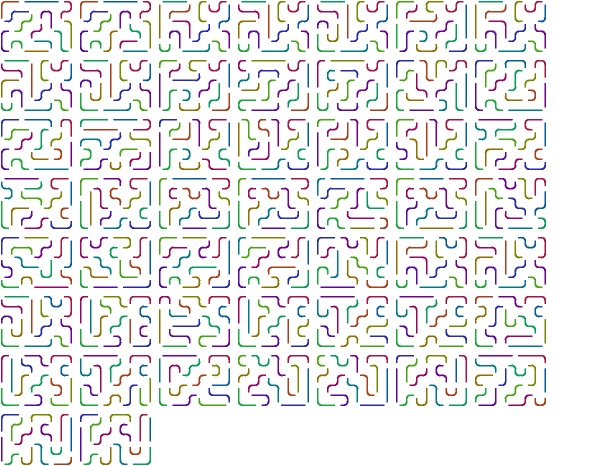 Some good new coloring problems using multiple sets of polyominoes. David Goodger has been doing some good work on triangular and hexagonal grid polysticks. George Sicherman is continuing to make advances in the realm of polyform compatibility problems. He also recently posted a catalog of the polypennies up to order 6. KSO Glorieux Ronse is a school in Belgium that has, over the past decade, conducted a wonderful educational experiment by posting contests based on polyomino problems that could be engaged with by their own students just as much as the world’s puzzle solving elite. (The latter tended to win, of course.) Their 50th contest, which they state was their final one, was held late last year. They solicited the polyform puzzle community for problems to use in the contest and got quite a few, including one from me. No word yet on the results of the contest, (or their previous one for that matter) but the problems there are still pretty interesting. I’ll be at the 10th Gathering for Gardner (G4G10) this week, and I expect that I’ll come back with quite a lot to think and post about. If you’re going to be there, my talk on Flexible Polyforms has tentatively been scheduled for the Thursday morning session. I hope to see some of you there! It might be nice to have some puzzle using these. So here is one! Fill in segments on the figure below so that each of the ten patterns above is represented on a 7-segment LED shaped subsection of the figure. Reflections and rotations of the patterns are considered equivalent. There are 13 7-segment LED shaped subsections of the figure, so three of them either can have other patterns, or can be duplicates. Are there any other puzzle grids that would make for a puzzle using these patterns that is as good or better than this one? If any of you haven’t seen them yet, Vi Hart’s “Doodling in Math Class” videos are some of the best expressions I’ve seen of the joy of Recreational Mathematics. The Snakes and Graphs one is especially good, and it contains, despite all of the Internet Meme Years that have passed, a Snakes on a Plane reference. I was, however, drawn to another source of closed curves. You can move a rook on a rectangular board in a series of single steps that visits every square once and returns to its starting point. Such a sequence is called a closed rook tour, and is the subject of an excellent article by George Jeliss. In graph theory terminology, a closed rook tour is a Hamiltonian of the graph with vertices that correspond to the squares on the board, and edges that connect vertices of neighboring squares. Closed rook tours have been enumerated for small rectangular boards, and it looked like there were enough of them to make it reasonable to hope that one of them could be tiled by a set of polysticks. The nine linear tetrasticks seemed like a good place to start, and have a convenient total length of 36, which is just right for a 6×6 square. Sadly, the linear tetrasticks have a parity problem that prevents them from forming a closed curve. (A closed curve must have even numbers of both horizontal and vertical segments. Three of the tetrasticks have odd horizontal / vertical parity, and so the full set must have odd numbers of each.) But we can repair this parity problem by adding the 4 linear tristicks to the mix, giving us a total length of 48, which should work on a 6×8 rectangle. Adding the tristicks also improves the flexibility of the set and should make solutions easier to find, which was welcome as I was trying to solve the puzzle manually. #17: Put these ——ing snakes on a ——ing closed rook tour of a 6×8 rectangular grid. As you can see, I didn’t quite find a solution myself, but I got close! Perhaps you will be luckier, more persistent, or smarter than I.
Update, 2011-2-4: George Sicherman has found a solution! Going back to graph theory terms, what we want is a 3-regular (each vertex has degree 3, that is, it has three edges connecting it to other vertices) spanning subgraph (a graph containing all of the vertices of the original, but not necessarily all of the edges.) A Hamiltonian could be called a 2-regular spanning subgraph, with the added provision that it must have a single connected component. I’m not worried about our solutions breaking into disconnected components in our 3-regular problems here. 3-regular graphs are also called “cubic”, but that term seems confusing in the context of polyforms, so I’ll avoid it. Another way to make 3-regular spanning subgraphs of a grid is to use a triangular grid. Because corners can connect to three other points, we can use finite sections of the grid this time. There are 12 tristicks on the triangular grid. The section of the triangular grid in the shape of the hexagon shown below has spanning 3-regular subgraphs with 36 edges. #19: Find a tiling of the 12 triangular tristicks on a 3-regular subgraph of a section of the triangular grid bounded by a convex hexagon with side lengths 2,3,2,2,3,2. Again, I got pretty close before I gave up; maybe you’ll have better luck. I’m pleased to have a problem that showcases the triangular tristicks. If the square polysticks don’t get the respect they deserve, this is doubly true for the triangular polysticks. Livio Zucca has a page with some triangular polystick solutions, (scroll most of the way to the bottom) but I can’t say that I’ve seen them elsewhere. Got any other ideas for figures of segments in a grid that could profitably be tiled with polysticks? Any ideas for interesting triangular polystick problems? If you do, please share them in the comments. So I needed a figure to tile with area 41 and perimeter 28, and came up with the shape above. There are 136 solutions for the tetromino tiling with the monomino in the center as shown. (See these solutions in a Java solver applet.) I’ve experimented a little with the tetrastick stage of the problem by hand, and I’m convinced that there are no tetrastick solutions for most, if not all, of these tetromino solutions. But if it doesn’t work out in the case with the monomino in the center, I suspect there are enough solutions with the monomino elsewhere for it to be very likely that one will work. Many of the tetromino solutions fail to contain a site where the “+” tetrastick can be placed that doesn’t overlap the “□”. Another issue that surfaces in this problem is horizontal-vertical segment parity. Eleven of the tetrasticks have even parity, that is, however you place them, they will always contain even numbers of both horizontal and vertical segments. Five of them have odd parity, and will always contain three segments of one orientation and one of the other. Because there are an odd number of pieces of odd parity, the parity of the set of tetrasticks as a whole must be odd. This means, without even starting to try placing tetrasticks on a tetromino solution, we can rule out the possibility of tiling it just by counting the number of horizontal or vertical segments. (Because the total is constant, we don’t need to count both.) If that number is even, the tetrasticks can’t tile the figure. The tetromino solution that I used in my attempt above has the correct (odd) parity. I dredged this problem up from my archive of the polyforms mailing list, where I posted it in February, 2001. It got no takers then, but I thought it an interesting enough problem to deserve a second airing. I looked for other problems of this type in preparing this post, but I didn’t find anything good. Having both the area and the perimeter of the figure to be tiled constrained by the pieces used limits the possibilities a lot.